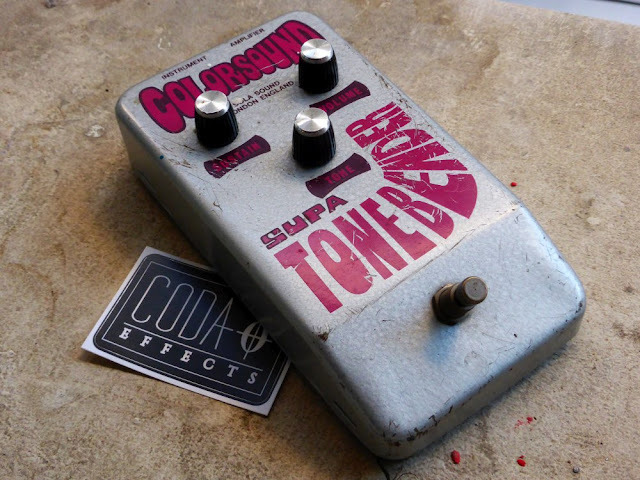 A nice reader of the blog lend me this super cool Colorsound "Supa" Tonebender, from 1973! Someone he knows found it in his garage and gave it to him (true story!). 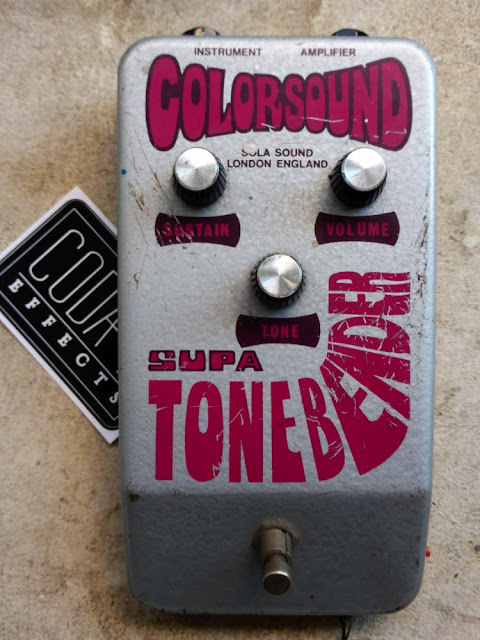 Colorsound is an old English brand that produced pedals during the late sixites. 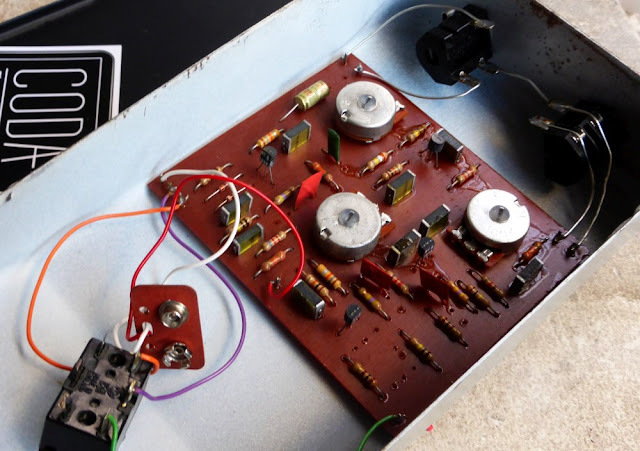 One of the most famous pedals they have produced is the Tonebender. Nice looking pedal huh? The enclosure is huuuge! At that time, guitar players did not have pedalboards, and circuits were rather big (we will see it later). Manufacturers preferred to make reliable, kick-proof pedals made for the stage and live situations. It has 3 knobs: volume, sustain and tone... Does it evoke something to you? Yes, you are right: Big Muff! This "Supa" Tonebender is indeed a Big Muff clone! It is a slightly modified Big Muff Ram's head "violet era" as we will see later. (note the inverted "amplifier" and "instrument" input, like on vintage fuzz faces). 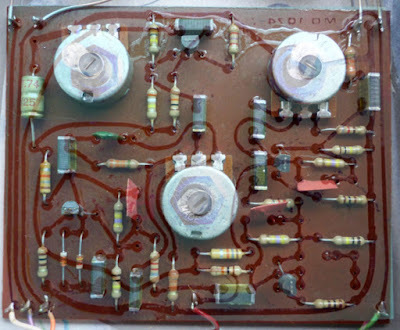 We can see 4 transistors, 470pF capacitors, everything that is included in a classical Big Muff circuit. Transistors are BC169B, silicon transistors with a hfe of about 200-250, which is quite a good range for a Big Muff (nice intermediate between high and low gain). You can still find some on ebay, contrary to EHX 2n5133, but are a bit expensive (2/3 euros for one transistor...). If you look carefully, you can see that there are only 2 diodes... Three components are missing: 2 diodes and the coupling capacitor of the first gain stage. However, there are still holes for them on the board! It seems like Colorsound staff wanted to copy the Big Muff circuit entirely, and then changed their mind (ethics? ), and remove the 2 diodes and coupling cap of the first gain stage. However on the first versions of the PCB like this one, the holes are still there! Beneath the PCB, it is quite funny looking! It is a really curvy PCB, traced by hand, that evokes the first PCB of the 60s/70s. 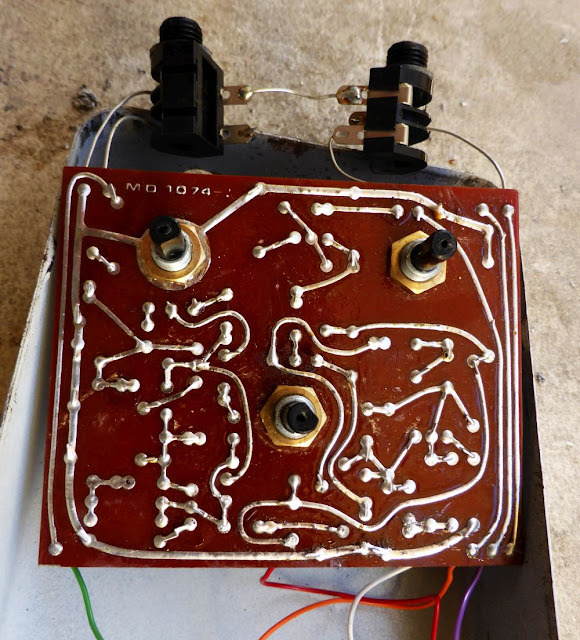 The PCB of the first Dallas Arbiter Fuzz face looks like this PCB. Nice looking pedal, vintage and all original! The gain potentiometer is a bit noisy, and there is a slight volume drop when pushed to max. It is probably a small deffect of the pots, that are usually the first components that get damaged. Unfortunatelly, these potentiometers are no longer in production, and not easy to replace without damaging / definitely alterate the pedal. I would rather have a bit of noise when turning the knobs than modifying heavily this cool vintage pedal! It sounds a lot like a Big Muff: compressed, heavy sounding device! The removed diodes of the first stage make it louder in volume, but it is still quite compressed and heavy sounding. Lot of bass too! Like a lot of Big Muff, it does not clean very well with the volume knob. You can see that the empty spaces with the holes let for the missing components are still connected to the circuit via the PCB. Thus, it should be possible to "mod" this Supa Tonebender to transform it into a Ram's Head violet era! However, I prefer to let it as is, all original! OK know that we have all the values, the ground and +9V buses marked, we can start tracing the circuit. As we know that it is inspired by a Big Muff, we can look at the classical schematic of the Big Muff to help us. The input goes through a 33k resistor, then a 0.1uF capacitor. 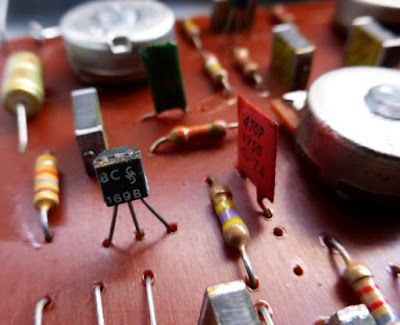 The capacitor is then connected to a 100k resistor connected to ground, that is also connected to the first transistor collector and a 470k resistor... It is the first gain stage of a Big Muff! Beware, BC169B have a weird pinout layout! 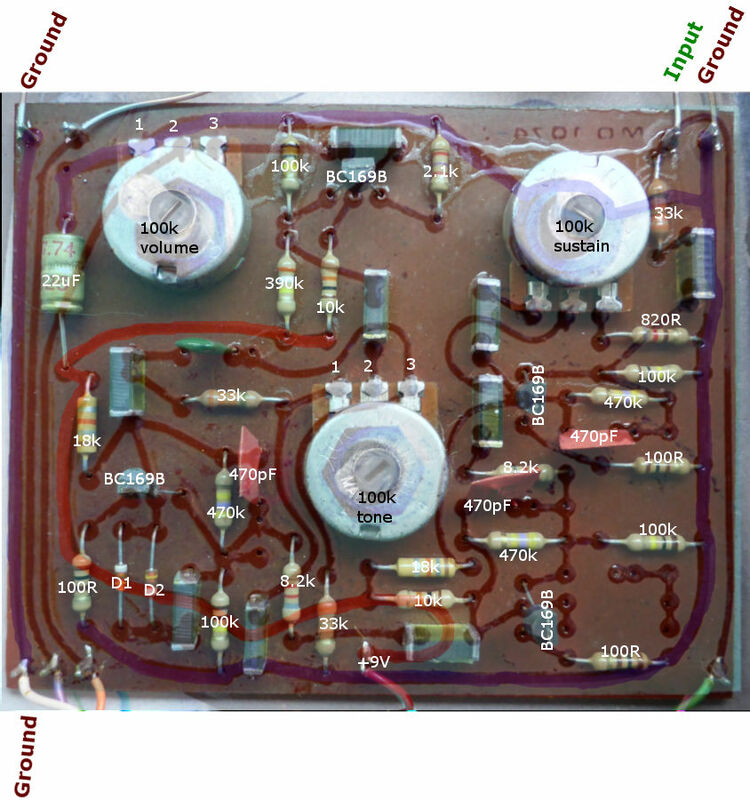 If you want to know how it works, read my article about the circuit analysis of the Big Muff. Hi! I was very impressed to turning big muff into tonebender. i'd like to add another footswitch with led indication before first clipping section in big muff, but i dont know how to connect a led diode without voltage drop or any impact (asymmetric clipping) on circuit. is there any suggestion please?